Until now, the NikeFuel currency was useful only for keeping track of personal movement goals. 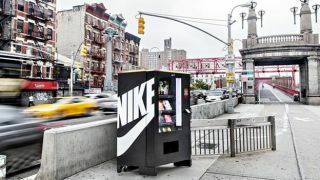 However, a New York vending machine is allowing fitness fanatics to get something tangible in return for all that sweat. The FuelBox, which seems to be on the move around New York City, allows FuelBand SE owners to cash in their NikeFuel on fitness gear like socks, hats and t-shirts. "The Nike+ FuelBox drops today and only your Nike+ FuelBand makes it work. Keep your eyes open. Keep your movement up," the company tweeted. Considering vending machines usually spit out garbage that's the very opposite of fitness-focused, this little marketing gimmick could spell a welcome change.